Pop-up banners (AKA retractable/roll-up banners) offer a wide range of flexibility in meeting your promotional display needs in Vancouver & beyond. These banners operate like movie projector screens; the banner pulls out and is ready to use in seconds. Light weight, compact design makes them easy to transport or ship. Each stand comes complete with an over the shoulder carry case. A variety of sizes and styles are available. Pop-up banners are an ideal display solution for trade-shows & conferences. 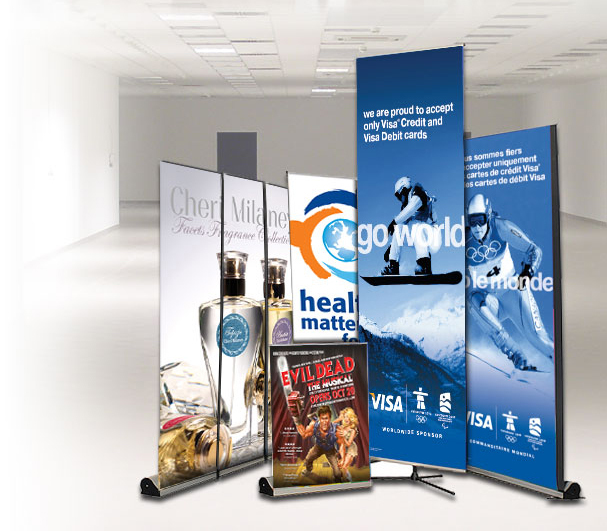 Read on for details & current pricing specials on LinxPrint’s most popular pop-up banners. Our premium banner hardware is constructed with materials carefully chosen for lower weight, high quality, and great usability. With a wide, flat base and adjustable feet, this stand offers a high level of stability and can be used on uneven surfaces. Ideal for heavy duty use over long periods of time. Comes complete with its own carrying bag. Both standard & premium grade hardware is compatible with our design template, available for download below. Our Pop-Up Banners are part of our current printing specials! For details please visit here!